The human mind is always in search of peace. For few this peace could be inside the corner of their home, for others might be in creativity and for few might be in tranquility. And again, peace can be the ultimate freedom- the moksha from this transient existence. But for many, peace lies inside the vibration of life along with the beauty of natural, radiant peace and the heartbeat of existence. Director Dar Gai involves her audience in an amazing journey in the movie “Namdev Bhau: In Search Of Silence”, where two protagonists are in search of tranquility – one knowingly and other unknowingly. Namdev Bhau (Namdev Gurav) is a 65-year-old chauffeur who lives in Mumbai. Namdev is tired with the hustle and bustle of city life, the continuous tangential chirping of his family members, and the witless behaviour of his boss and decides to stop talking and be silent. 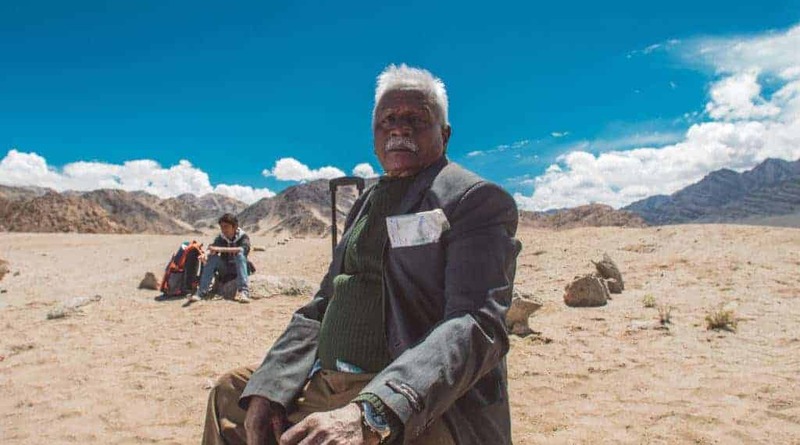 In search of quietude, Namdev leaves home and heads for the Himalayas in search of the silent valley. But while travelling, there are factors of disturbance for Namdev and those include machine to human. Even the symphony of nature has become acacophony for him. In his first night he meets a lady (Zoya Hussain) who is afraid of ghosts and knocks his door and decides to stay with him in a hallowing night. She is a chatterbox and Namdev doesn’t hesitate to leave her behind next day morning. And now enters the second protagonist of the movie- Aaliq (Arya Dave), a twelve-year-old boy, who is running away from home to reach the red castle. And the narrative continues under the beautiful scenic of Himalayas with the on-growing friendship of a 65-year-old man who has lost interest in life with a twelve-year-old boy full of energy and life – till they reach Aaliq’s destination – the red castle. Namdev Gurav is a chauffeur in real life, a newcomer in the tinsel town and has been brilliantly used by the director Dar Gai to portray her thoughts. Throughout the movie, itfeels like Namdev is just acting and his expressions are not natural, and that’s exactly what is needed for the narrative. Namdev has lost interest in life, staying within the materialistic hustle and bustle of the city, and whatever he is performing to keep the motion moving is all against his will. So, he never expresses his thoughts – he just acts and its perfectly blends with the narrative. Even in the last scene, when Namdev feels the importance of joyous expressions in the rhythm of life, he just cannot express it. And the director brings it back on his face with a forcefully created awkward smile which is another thought-provoking directorial approach from Dar Gai. Arya Dave is brilliant as Aaliq, who injects the spirited nature of life in Namdev that subsequently forces him to break his silence, to feel the importance of joyous utterances of life. Dar Gai has used the vibrant nature of Arya intelligently in the movie to blend in the ray of life in Namdev, in scene after scene. Zoya Hussain has a brief presence in the movie but Gai uses her screams in the middle of dark night to glorify the presence of life in the darkness of nature, which one cannot ignore or escape. The beauty of the nature has been used brilliantly by Dar Gai to enhance the desire to back in the main stream of life in the mind of Namdev in the movie. And the aesthetic cinematography of Aditya Varma enlightens the audience with the sparkles of beauty of the nature, and surely, it’s the third protagonist of the movie. Life is rhythmic in its own way. The joy of life lies inside its own natural flow and we cannot live ignoring or escaping it. Director Dar Gai has pitted two protagonists against each other in this movie, who are character wise poles apart but walking through the path of life, keeping the conflict between peace and noise alive, where both are required to complete this journey. And when Aaliq reaches his destination – the red castle of tranquility, Namdev comes back to the main stream of life taking the baton from him to keep this flow of life alive. Great concept and a must watch!